Disk herniation is a breakdown of a fibrous cartilage material (annulus fibrosus) that makes up the intervertebral disk. The annulus fibrosus surrounds a soft gel-like substance in the center of the disk called the nucleus pulposus. Pressure from the vertebrae above and below may cause the nucleus pulposus to be forced against the sides of the annulus. The constant pressure of the nucleus against the sides of the annulus will cause the fibers of the annulus to break down. As the fibers of the annulus break down, the nucleus will push toward the outside of the annulus and cause the disk to bulge in the direction of the pressure. This condition most frequently occurs in the lumbar region and is also commonly called a herniated nucleus pulposus, prolapsed disk, ruptured disk, or a slipped disk. The spinal column is made up of 24 vertebrae that are joined together and permit forward and backward bending, side bending, and rotation of the spine. There are seven cervical (neck), twelve thoracic (chest region), and five lumbar (low back) vertebra. There are intervertebral disks between each of the 24 vertebrae as well as a disk between the lowest lumbar vertebrae and the large bone at the base of the spine called the sacrum. Disk herniation most commonly affects the lumbar region. However, disk herniation can also occur in the cervical spine. The incidence of cervical disk herniation is most common between the fifth and sixth cervical vertebrae. The second most common area for cervical disk herniation occurs between the sixth and seventh cervical vertebrae. Disk herniation is uncommon in the thoracic region. The peak age for occurrence of disk herniation is between 20 and 45 years of age. Studies have shown that males are more commonly affected than females in lumbar disk herniation by a 3:2 ratio. Long periods of sitting or a bent-forward work posture may lead to an increased incidence of disk herniation. A protrusion occurs when a disk bulges without rupturing the annulus fibrosus. A prolapse occurs when the nucleus pulposus pushes to the outermost fibers of the annulus fibrosus but does not break through them. An extrusion occurs when the outermost layer of the annulus fibrosus is torn and the material of the nucleus moves into the epidural space. A sequestration occurs when fragments from the annulus fibrosus or the nucleus pulposus have broken free and lie outside the confines of the disk. Any direct or, forceful in a vertical direction pressure on the disks can cause the disk to push its nucleus into the fibers of the annulus or into the intervertebral canal. 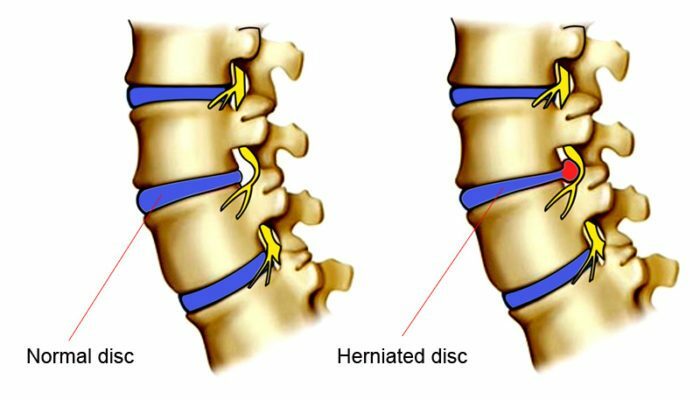 A herniated disk may occur suddenly from lifting, twisting, or direct injury, but more often it will occur from constant compressive loads over time. There may be a single incident that causes symptoms to be felt, but very often the disk was already damaged and bulging prior to any one particular incident. Depending on the location of the herniation, the herniated material can also press directly on nerve roots or on the spinal cord. 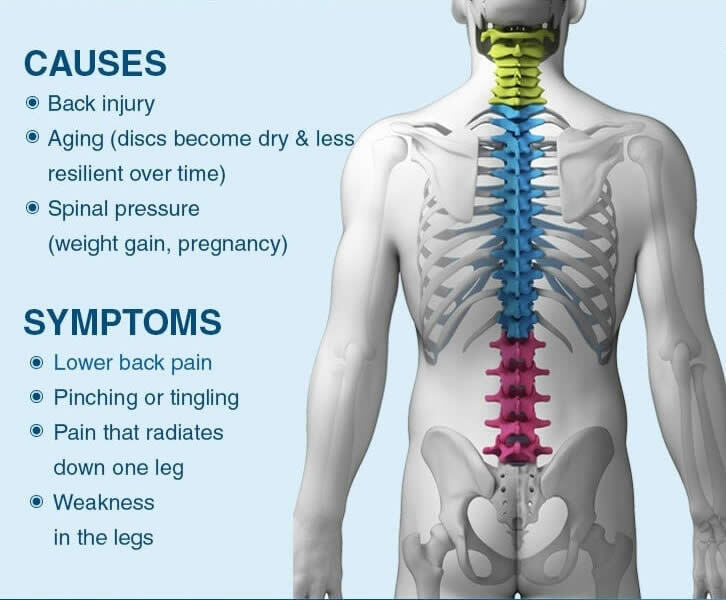 Pressure on the nerve roots or spinal cord may cause a shock-like pain sensation down the arms if the herniation is in the cervical vertebrae or down the legs if the herniation is in the lumbar region. 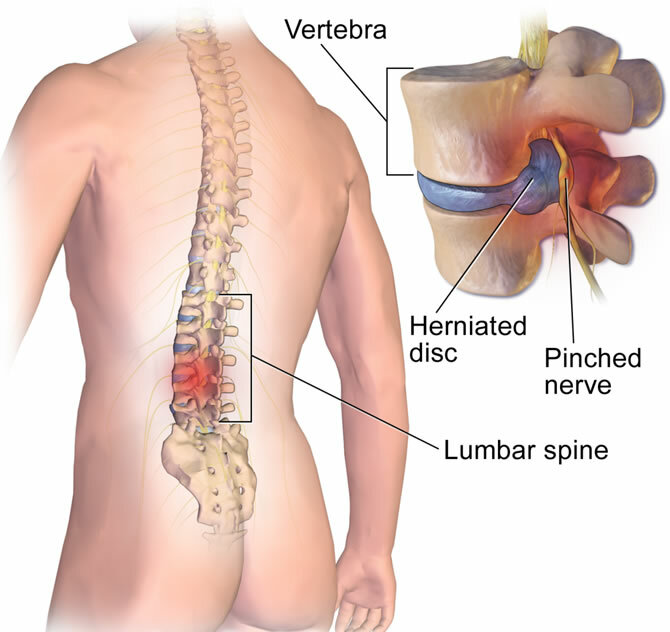 In the lumbar region a herniation that presses on the nerve roots or the spinal cord may also cause weakness, numbness, or problems with bowels, bladder, or sexual function. It is unclear if a herniated disk causes pain by itself without pressing on neurological structures. It is likely that irritation of the disk or the adjacent nerve roots may cause muscle spasm and pain in the region of the disk pathology. Several radiographic tests are useful for confirming a diagnosis of disk herniation and locating the source of pain. X rays show structural changes of the lumbar spine. Myelography is a special x ray of the spine in which a dye or air is injected into the patient’s spinal canal. The patient lies strapped to a table as the table tilts in various directions and spot x rays are taken. X rays showing a narrowed dye column in the intervertebral disk area indicate possible disk herniation. Computed tomography scan (CT scans) exhibit the details of pathology necessary to obtain consistently good treatment results. Magnetic resonance imaging (MRI) analysis of the disks can accurately detect the early stages of disk aging and degeneration. Electromyograms (EMGs) measure the electrical activity of the muscle contractions and possibly show evidence of nerve damage. A number of physical examination procedures may be used to determine if a herniated disk is pressing on nerve root. While these tests may not identify the definitive presence of a herniated disk, they are very useful for indicating if there is pressure on a nerve root from some structure such as a herniated disk. The straight leg raise test may be used to identify pressure on nerve roots in the lumbar region while the Spurling’s test (involving neck motion) may be used to identify compression of nerve roots in the cervical region. Compression of nerve roots in the cervical, thoracic, or lumbar regions may be apparent with the slump test. It is unclear if herniated disks cause pain themselves, or if they must press on a nerve root to cause pain. Pain may also occur with herniated disks as a result of mechanical or neurological irritation of surrounding structures such as muscles, tendons, ligaments, or joint capsules. Therefore, many treatment strategies will be primarily focused on managing symptoms that occur in conjunction with a herniated disk. Unless a serious neurological problem exists, most symptoms of a herniated disk will resolve on their own. Yet, the interventions listed below may greatly speed the time required to resolve symptoms associated with a herniated disk. Chiropractic manipulations are often used to treat herniated disks. There is often significant joint restriction that accompanies a herniated disk and the manipulative therapy is effective at helping to mobilize movement restrictions in the spine. Mobilizing the spine will help the patient get back to moderate activity levels sooner. The earlier an individual can return to moderate activity levels, the quicker they can expect a resolution of their symptoms. Chiropractic manipulations are generally done with a greater frequency when a condition is in an acute stage. The frequency of treatments will be reduced as the condition improves. Osteopathic therapy, considered by some to be an alternative treatment, may use manipulations or manual therapy techniques very similar to those of chiropractors. However, osteopathic physicians often employ more manual therapy techniques that focus on the role of the muscles and other soft tissues in producing pain sensations with herniated disks. Osteopathic physicians may also recommend use of the same medications prescribed by allopathic physicians. Some osteopaths also perform surgery for herniated disks. Acupuncture involves the use of fine needles inserted along the pathway of the pain to move energy through the body and relieve the pain. Neurological irritation is considered to be a frequent source of pain with a herniated disk. Many believe acupuncture is particularly effective for pain management and addressing this neurological irritation. Acupuncture can also help break the cycle of pain and muscle spasm that often accompanies a herniated disk. Massage therapists focus on muscular reactions to the herniated disk. Neurological irritation that comes with a herniated disk will often cause excessive muscle spasms in the lower back muscles. These spasms will perpetuate dysfunctional movements in the joints of the spine and may exaggerate compressive forces on the intervertebral disk. By relaxing the muscles, massage therapists will attempt to manage the symptoms of disk herniation until proper movement can be restored. Proper movement and avoidance of aggravating postures, like sitting for long periods, will often be a great help in completely resolving the symptoms. Unless serious neurologic symptoms occur, herniated disks can initially be treated with pain medication. Pain medications, including anti-inflammatories, muscle relaxants, or in severe cases, narcotics, may be used if needed. Bed rest is sometimes prescribed. However, bed rest is frequently discouraged as a treatment for herniated disks unless movement is severely painful. It has become apparent that prolonged periods of bed rest may aggravate symptoms, slow down the healing time, and cause other complications. Epidural steroid injections have been used to decrease pain by injecting an anti-inflammatory drug, usually a corticosteroid, around the nerve root to reduce inflammation and edema (swelling). This treatment partly relieves the pressure on the nerve root as well as resolves the inflammation. Physical therapists are skilled in treating acute back pain caused by disk herniation. The physical therapist can provide noninvasive therapies, such as ultrasound or diathermy, to project heat deep into the tissues of the back or administer manual therapy, if mobility of the spine is impaired. They may help improve posture and develop an exercise program for recovery and long-term protection. Traction can be used to decrease pressure on the disk. A lumbar support can be helpful for a herniated disk at this level as a temporary measure to reduce pain and improve posture. Surgery may be used for conditions that do not improve with conservative treatment. There are several surgical approaches to treating a herniated disk. A number of surgical procedures may be used to remove a portion of the intervertebral disk that may be pressing on a nerve root. When a portion of the disk is removed through a surgical procedure it is called a discectomy. Sometimes a spinal fusion will be performed after disk material has been removed. In this process a portion of bone is taken from the pelvis and placed between the bodies of the vertebrae. A spinal fusion will limit motion at that vertebral segment, but may be helpful in the event that significant disk material has been removed. Chemonucleolysis is an alternative to surgical removal of the disk. Chymopapain, a purified enzyme derived from the papaya plant, is injected into the disk space to reduce the size of the herniated disks. The reduction in size of the disk relieves pressure on the nerve root. In 2002, Tokyo doctors produced evidence that a growth factor called vascular endothelial growth factor (VEGF) may speed up the process of injured disk resorption. In September 2002, a noted orthopedic and spine authority named John Engelhardt became the first American to receive an artificial disk replacement (using the Bristol disk) in an operation in Switzerland. The artificial disk technology was still in clinical trials in the United States and was not expected to be approved until about 2005 or later. Only a small percentage of patients with unrelenting neurological involvement, leading to chronic pain of the spine, need to have a surgical procedure performed. This fact strongly suggests that many patients with herniated disks respond well to conservative treatment. Alternative therapies can play a significant role in managing the pain and discomfort for the majority of patients with a herniated disk. In fact, magnetic resonance imaging (MRI) studies of the lumbar spine have indicated that many people without any back pain at all have herniated disks. This finding means it is unclear what role the herniated disk plays in many back pain cases. For many of these patients, proper symptom management of pain and improvement in joint motion and mobility through manual therapies will be enough to fully resolve their symptoms. For those patients who do require surgery, options are available for newer and less invasive procedures that will allow a quicker healing time. Proper exercises to strengthen the lower back and abdominal muscles are key in preventing excess stress and compressive forces on lumbar disks. Good posture will help prevent problems on cervical, thoracic, and lumbar disks. A good flexibility program is critical for prevention of muscle spasm that can cause an increase in compressive forces on disks at any level. Proper lifting of heavy objects is important for all muscles and levels of the individual disks. Good posture in sitting, standing, and lying down is helpful for the spine. Losing weight, if needed, can prevent weakness and unnecessary stress on the disks caused by obesity. Such alternative treatments as chiropractic, massage therapy, or acupuncture may play a very important role in prevention of herniated disk problems. Regular use of these approaches may help maintain proper muscular tone and reduce the cumulative effects of postural strain that may lead to the development of disk problems.